Born in June 1947 in Brighton (Sussex), Tim Hollier soon re-located with his family to Seascale (West Cumberland). At school he met Rod Alexander (g, later with V.I.P. 's, Green Bullfrog and Axe) and in 1960 they formed The Meteors together with Terry Hewitt (b) and Mike Beresford (d, soon replaced first by Keith Henderson and then by Brian "Chico" Greenwood, later of Jasper, Trifle, Moonrider, Gonzalez, Nicky James and Patrick Hernandez). In 1963 Tim went to Carlisle Art College and while studying he played with some success on the local folk club scene in a duo called Sovereigns (with his cousin Robbie Peckford). A couple of years later Tim moved to London to attend the London College of Graphic Design, where he met Canadian guitaristsinger Rick Cuff: the two began playing together and performed live in the capital city's venues of the time opening for well known acts, such as Jo-Ann Kelly, Roy Harper and even Paul Simon. Thanks to Charlie Crane (singer with Cryin' Shames and Gary Walker & The Rain), Tim came into contact with Simon Napier-Bell, who was working with David Hemmings' Hemdale Company, and in June '68 he signed for United Artists. With a good budget from the label and the help of fine musicians of the calibre of John Cameron, Gerry Conway, Herbie Flowers and David & Jonathan. 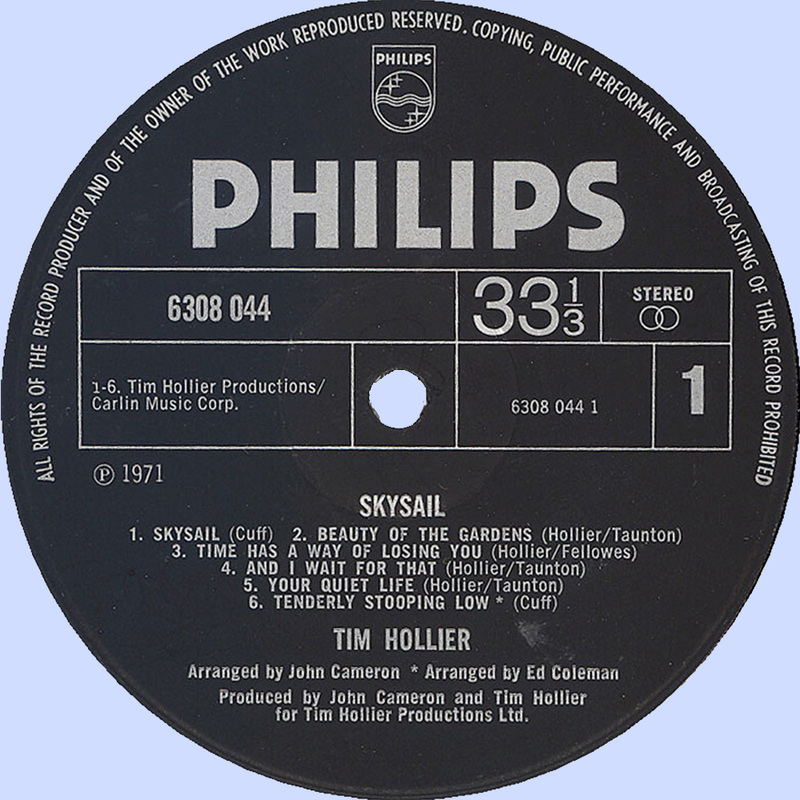 The third and final "proper" Tim Hollier LP was issued in March 1971, once again arranged by John Cameron. Here Tim sang three Rick Cuff-penned songs, of which especially "Tenderly Stooping Low" (already sung by Amory Kane on his second long-player) was particularly noteworthy. Cameron's orchestrations were at times too mellow, but songs like "And I Wait For That" (co-written by photographer Jeremy Taunton) and "Time Has A Way Of Losing You" (with lyrics by Rory Fellowes) still stand out, the last track of which was the impressive "While London's Days Increase" (lyrics by Fellowes). 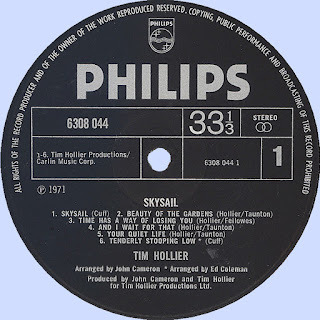 After a second (and final) single, issued in July 1971, which included a cover of Gordon Lightfoot's "The Circle Is Small", Tim Hollier's recording career halted for a while. 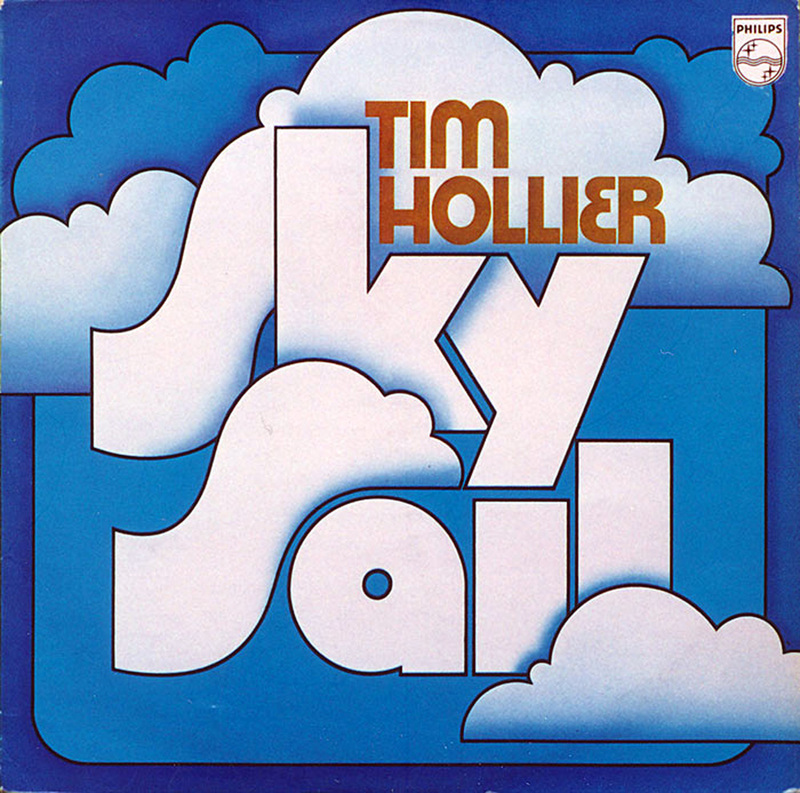 Tim Hollier died on 5 July 2017 due to complications of surgery.